Mr. Matrimony and I have the greatest bed. I found it at http://www.rcwilley.com/ in the clearance section. They always have loads of great deals. They ship internet items to the store for free. If you have an RC Willey, I highly recommend checking out their website. Oh, they also have a clearance room onsite. It’s usually amazing as well! Not so long ago, we bought a new mattress. It made our bed super high! It also dwarfed my bedside table. When I came across these legs…. Well, it was inspired from a Pin I had seen awhile back, so a picture wouldn’t be unlikely. Anyways, I asked Mr. Matrimony to attach these free legs to my bedside table. 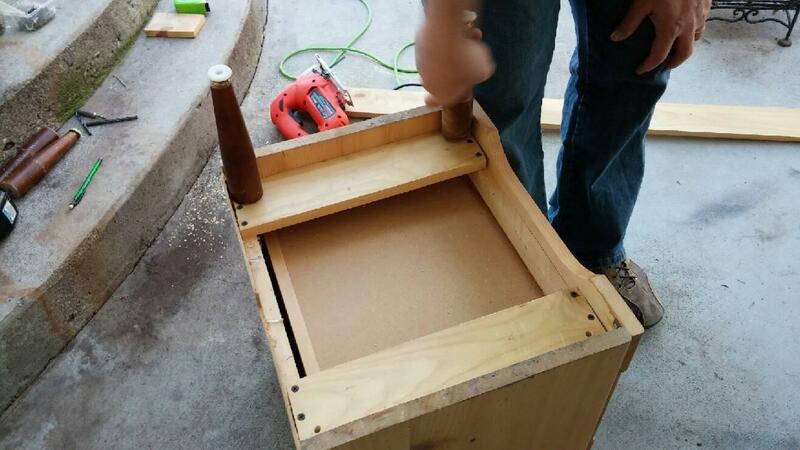 First, he had to add boards to the bottom of the piece because there was no bottom. He used a 1×4 and cut it down to two pieces. 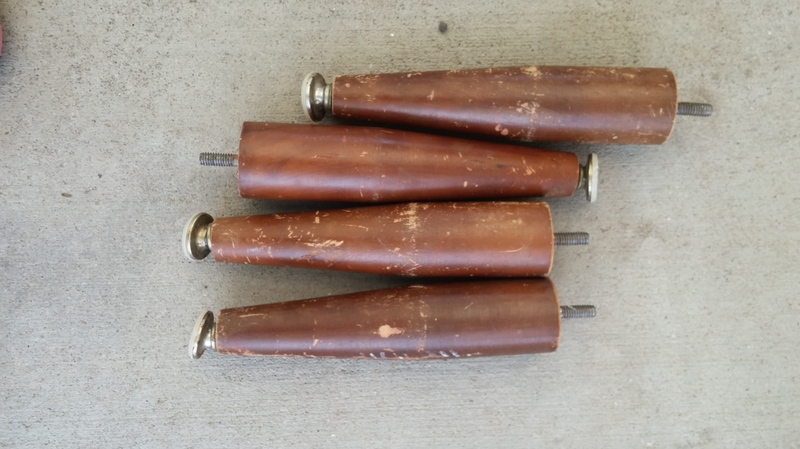 Here’s what they looked like after he installed them…. 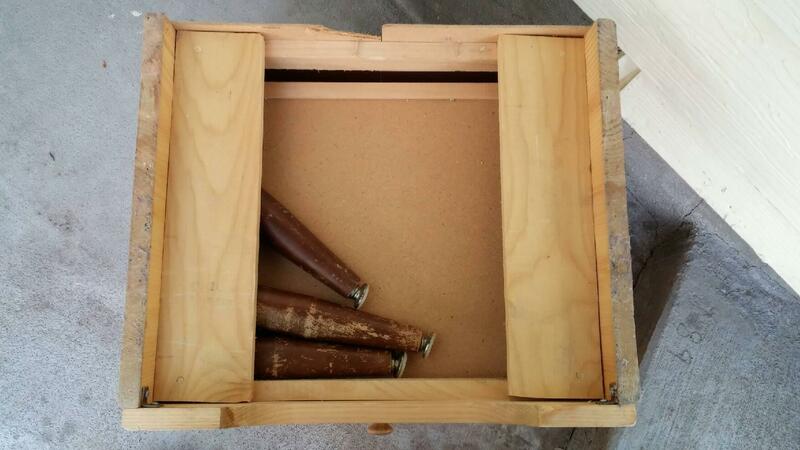 Here’s a view from the front, with the drawers removed…. Next, he simply screwed the legs into the boards. He put them right up next to the corners to give it extra strength. I forgot to take pictures while I was painting it. It was quite easy though because I did it all in an espresso brown. I might doll it up later, but for now, it’s quite perfect! Isn’t it sweet?!!??! I just love it! 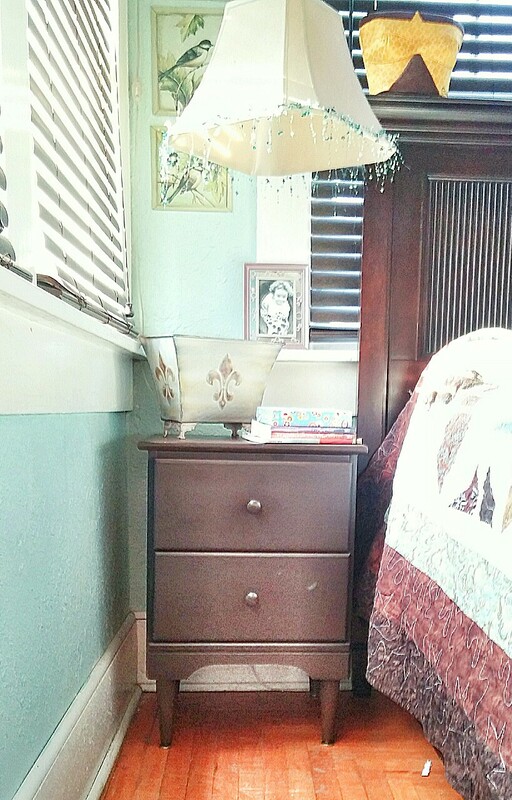 Have you upcycled any of your furniture in order to make it more efficient in your home? My mama and I used to own a few coffee shops. Most, were drive through espresso stands. There are so many must-learn tricks of the trade that when you leave that field, you naturally take them along with you. The other day, I came across one of our laminated drink recipe cheat sheets. This was one of the cards we kept behind the counter for our baristas to use when they couldn’t remember a recipe. I realized, I’m sorta privy to these recipes and many other coffee drinkers, are not. So, I’m going to share. Don’t fret, it isn’t like a magician giving away magic secrets. These drinks are each commonly know by someone, someplace. The special thing about this list is the recipes are all together! So without further ado…. First, you need flavored syrup. Some, you can make yourself. Recipes are all over Pinterest and internet search engines in general. I buy my syrups at Cash & Carry. Cash & Carry is a grocery store that specializes in selling to restaurants. It has many items in case lots (Check out their other areas while you’re there! It’s awesome!). 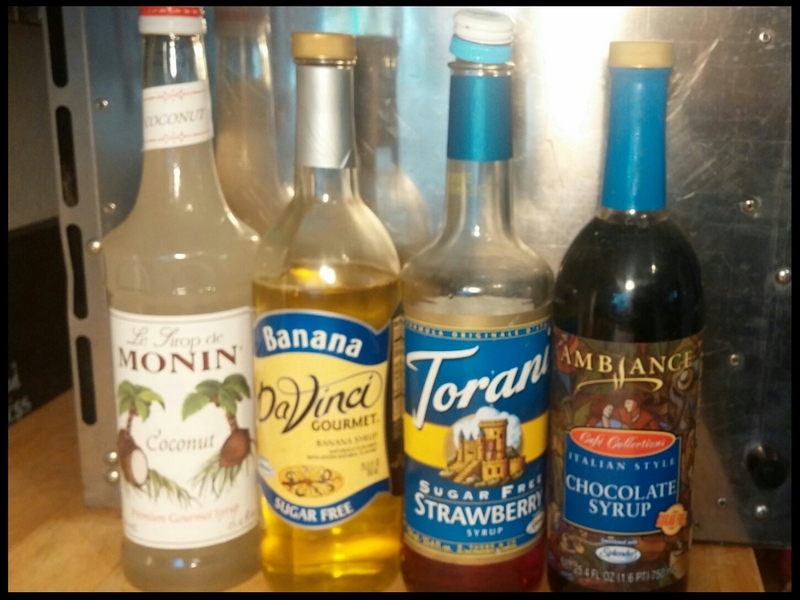 My favorite syrups vary, but Monin (emphasis on the “nin”) is usually made with natural flavors, giving it the advantage of most realistic taste. It also makes it more expensive! One other down-side, is it doesn’t have as many flavors (It does have unusual flavors though. One favorite is “Lavender”. It’s super yummy in lemonade!) Torani is ok for the most part. I find a lot of their flavors are too sweet. Sometimes, you can just adjust the amount. Often though, that removes some of the flavor you are wanting. I’d say the best all-around winner would be Davinci. Their flavors are pretty true-to-taste, and the price is good. A lot of shops in our area use Davinci. It is what we used the most of in our own shops. One more choice, as far as Cash & Carry is concerned, is Ambien. Ambien is Cash & Carry’s store generic brand. It is very similar to Davinci, and priced lower. It doesn’t have as many flavors, but it’s good. Did you know an Ethiopian goat herder discovered coffee? 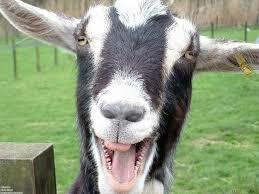 He noticed how crazy his goats would act after they had eaten coffee beans! Secondly, if you have a way to make espresso shots and froth milk, that is awesome… you’re on your way! If not, let me assure you there several ways to come up with semi-pro drinks at home without spending a fortune. You can buy a frother at IKEA for like 5 bucks. It’s battery operated and works ok, once you get the knack of it. There are other, fancier ways to froth the milk, but they are mostly all very expensive. For me, I sometimes use a Moka pot for the shots, heat my milk and froth it with the IKEA frother. Often times though, and this may sound scary to you purists… I use instant (egads!!!) espresso (Starbucks Brand) and add it to my frothed milk, which in my case, is half & half because this girl likes a breve! It seems so crazy to me too. I promise though, it’s a must try! Starbucks brand espresso is more expensive but, 1) It’s the only instant espresso available at our little town’s only grocer, and 2) It really is close to the real thing, and 3) It costs much less than going to a drive through! Now that you have your latte (or mocha, or ???) figured out, let me help you decide which drink to make…. I realize that in different shops, and especially in different parts of the country, these recipes may vary. 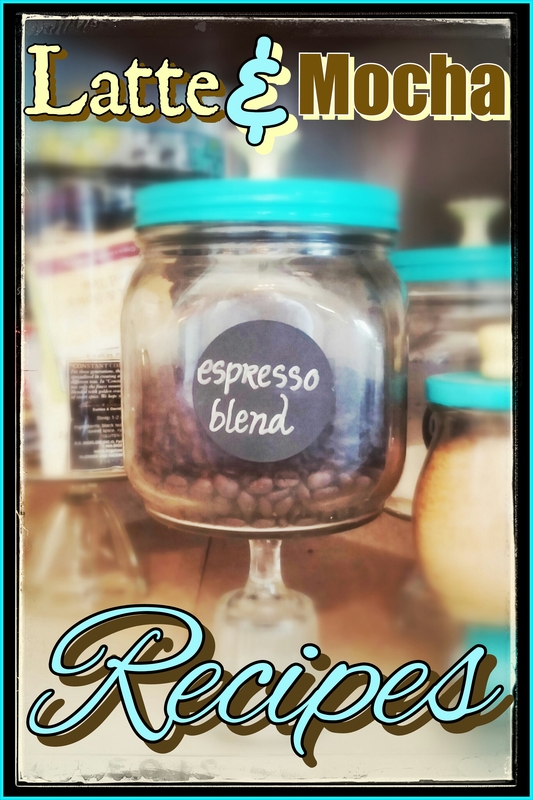 That is one of the joys of experimenting with coffee flavors… you can make exactly what you want, the way you want it!!! 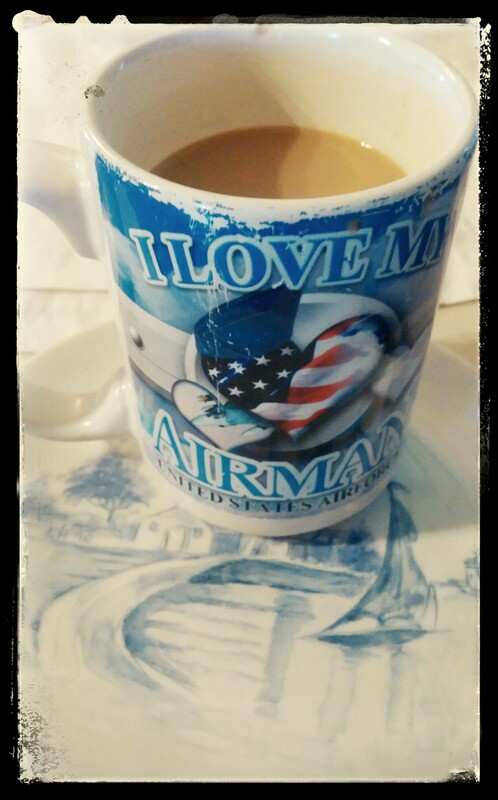 My morning cup of Joe on a plate my mama painted in 1970. Seems like a great article too! I finished the napkins last night. They are so cute! 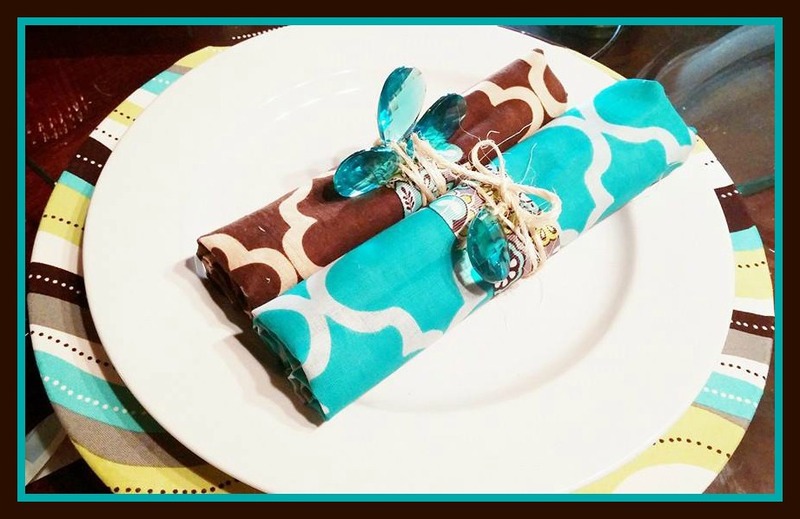 Here’s what you’ll need to make these napkin rings…. I’ve made some pretty good pictorial directions for this post. Let’s start with one of them. 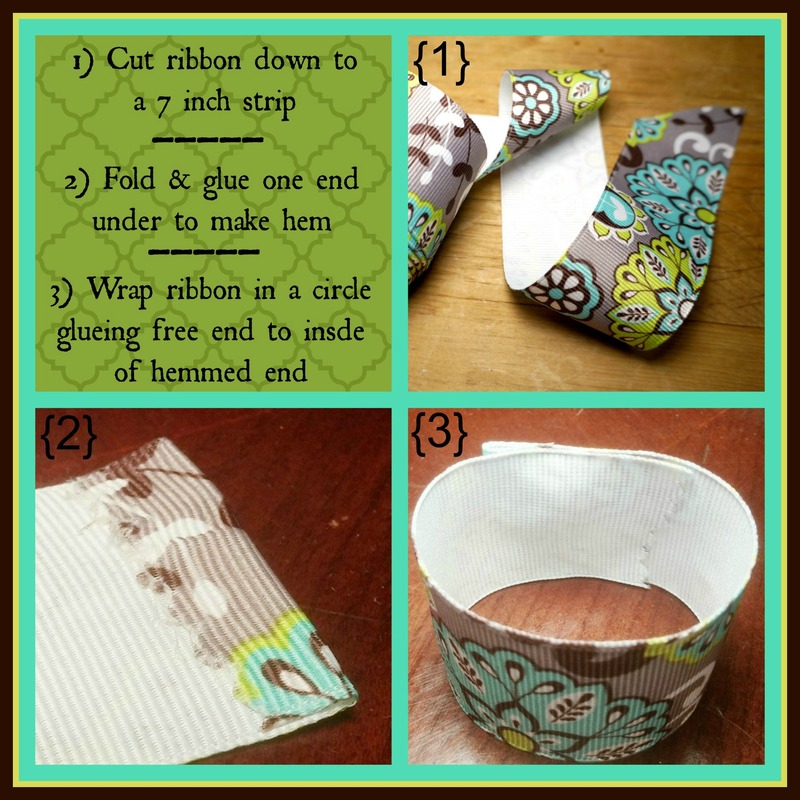 First, you will be making the actual napkin ring with the fabric…. 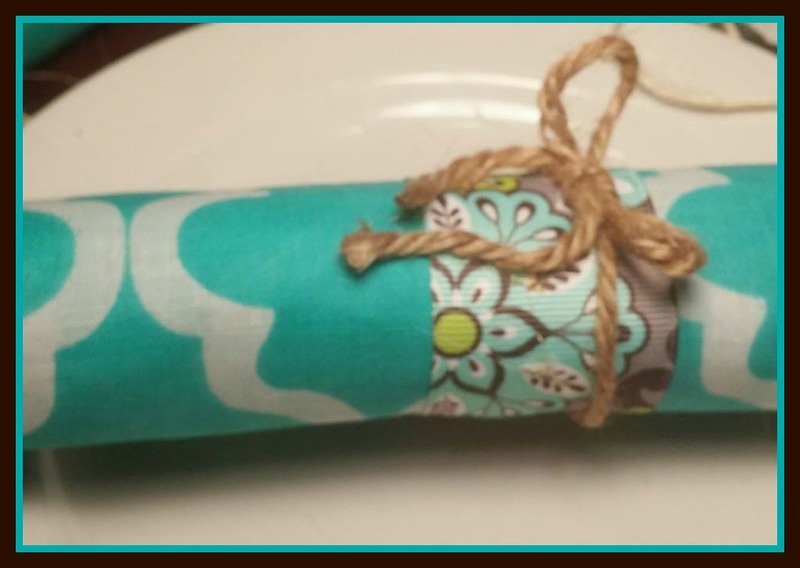 You may want to make your napkin rings a little bigger. If you do, just add however much you need. 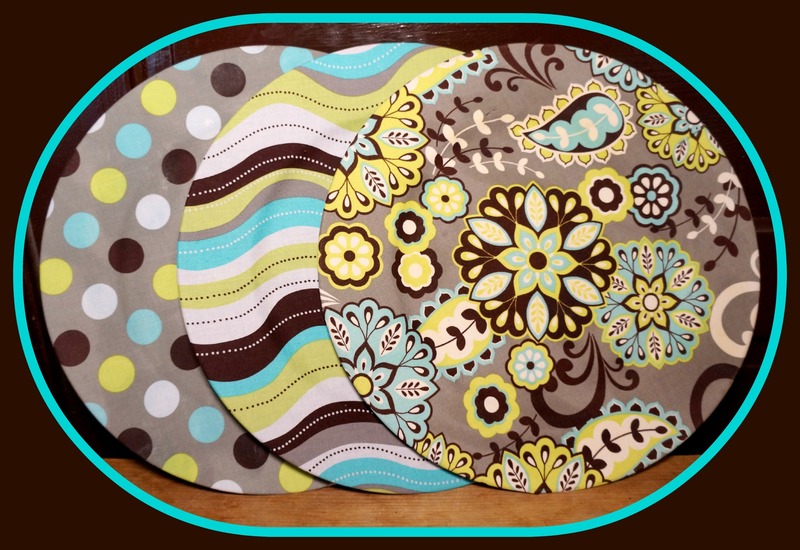 I like to put our guest flatwear in our napkins, roll them up, and put them in the rings (like in a restaurant). It’s something that looks good displayed all the time. Also, having them rolled and ready makes prep time shorter when we are having guests over for a meal. Cut the ribbon at a slant or with pinking shears. This will keep them from unraveling. Now to adorn the napkin rings. Really, you can use anything you’d like. I found these plastic crystal dangly things at Hobby Lobby for $4.18. There’s at least 200 in the bag. Score! I simply tied a piece of twine around it and tied a bow like one would do with their shoelaces. 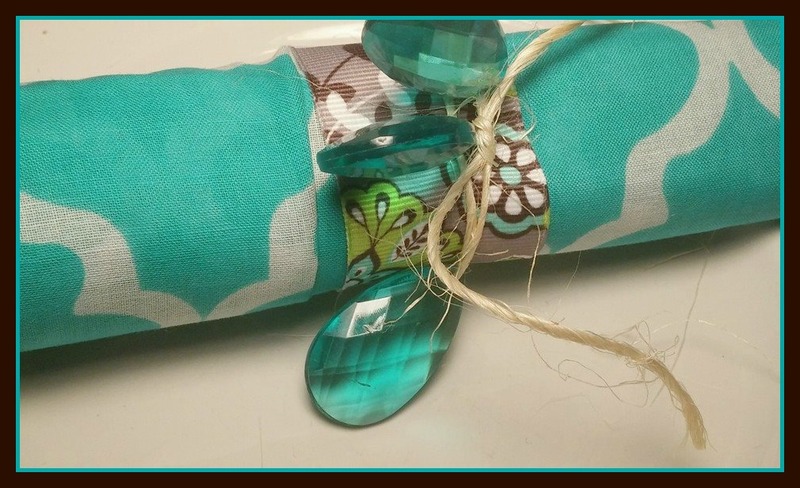 I glued the loose ends to the ribbon so they would hold the shape I wanted them in. I threaded 3 plastic crystal thingies on the twine at about 3-4 inches apart. I then wrapped the twine around the ribbon. With some, I left the ends long, but on others, I cut it off. 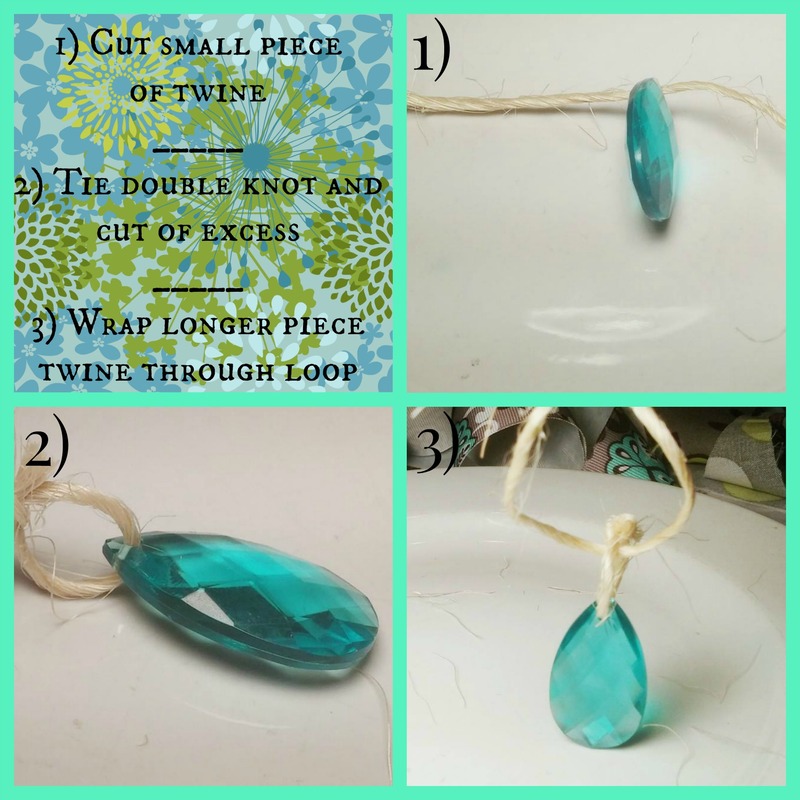 When you string the plastic crystal thingies on the twine, they don’t lay flat. That was fine and still looked cute when I put more than one on each piece. When I did only one though, it just wasn’t right. It needed to lay flat. So, I came up with this idea…. I made pendants with a second piece of twine! 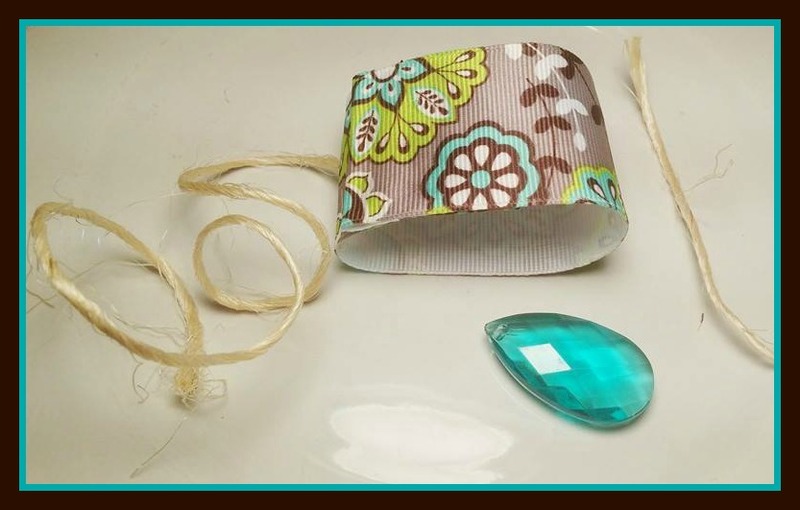 When it was done, I just wrapped the longer piece around the ribbon and tied a bow, like this…. They are just so sweet. I hope you enjoy what you come up with. If you have any questions about attaching different adornments, just ask. I’d love to help! 94 is a very big number. There are a lot of decades behind it, if it is in years. Next week, my age will be half of 94, and that in itself seems like a lot of numbers. I. Can. NOT. Do. THIS. I prefer to think his feelings were more about not being able to again create someone he would fall so hard for. His baby girl. He wasn’t always there. He wasn’t always great when he was there. I’m certain I was worse. But I never doubted he loved me, and that I was his baby girl. And the days we had together when I was little, in my mind… were perfect. Something that the doctors thought literally broke his heart, was when mine was broken. I wish he could peak inside my heart now. He would see Mr. Matrimony there, and my dad’s own heart would have been healed. His words of White steam cars, and how they move, would have no better landing spot that my son’s eager ears. I think that is probably what I long for most when I think of Dad. I wish my son could come home from visiting “Cap’n”. Mr. Awesome would smell of kerosene and cigars. He’d have even more stories to share with me. 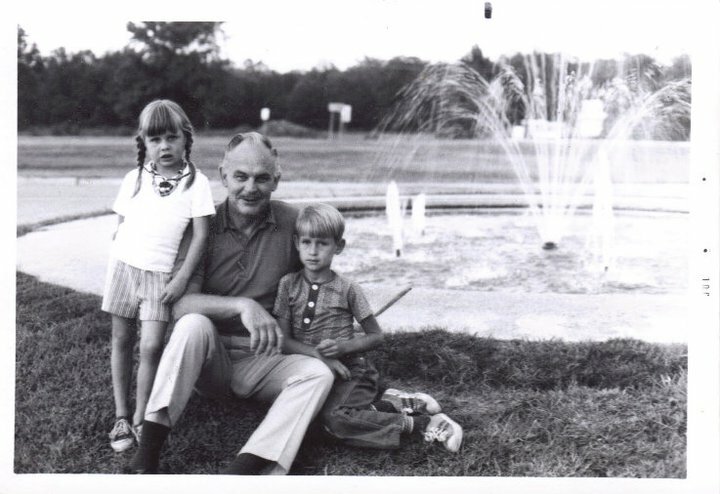 He would have loved my dad. Dad would love his grandson too. They’d probably be the best of buddies. With his mind aging, Dad could lean on my son’s explanations of things. They would teach each other. Sometimes the things we miss the most are the things we never experienced. Make sure you are savoring every good thing you do experience, so you will miss them when they’re gone. On one of my very first trips to Hobby Lobby, I found this ribbon…. I bought it for the specific purpose of adorning baby Onesies I sell online. Over the past months while working on crafting, I’ve realized this particular ribbon out of the many I 0wn, is the one that always catches my eye first. Often, my eye lingers on it. It never ever dawned on me to use such bold colors in my home. I’m not sure why. In many ways (probably most of my ways) I’m bold. I’ve just never done anything like that in my décor. I took a step out in faith in bright colors, and added a piece of this ribbon, about 10 inches long, to a sort of art piece I have in my kitchen. From that little tiny step, I made multiple baby steps. Then, I made a couple of small puddle jumps, finally leaping into the china cabinet in the dining room to add some color. To some, it may not seem like a leap at all. For me it was huge. Now, I don’t know if I can be stopped! I’m not saying these colors (all of which by-the-way, look like they escaped from my Aunt Betty’s 60’s kitchen) are going to be plastered all over the house. But, I am saying they are going to be a lot more prevalent in our home’s décor. I’m loving them so much and they just make me smile! How could I not want that happy happy joy joy to come from every-other-here-and-there? For this series, I was inspired by some chargers I saw that were covered in burlap, so today on a girl’s day out, some friends took me to the big city. Imagine my delight, when we were in Hobby Lobby, and in the 30% off fabrics were coordinating fabrics that go with my ribbon! I couldn’t believe it! 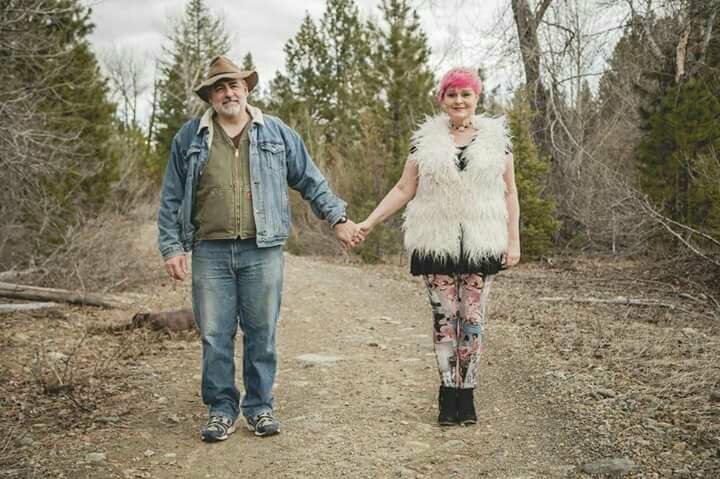 I almost didn’t get even any of the fabrics that match, but my friend Ruth stepped in. She pointed out that I could do more than one print on my chargers. I am so serious in telling you, this had never crossed my mind. People are always saying I’m so creative, but truly, moments like Ruth finding 3 coordinating fabrics that I love, but can’t even envision in my home, just humbles me. I was walking all over the fabric department, like a crazed loon (we had girls waiting for us in the car! ), searching for just the right fabric. I had one bolt in my arm that had jumped out at me. As I looked at it more though, while carrying it around, it just seemed a little boring. It had fun colors in it, but it wasn’t fun colored…. ya know what I mean? 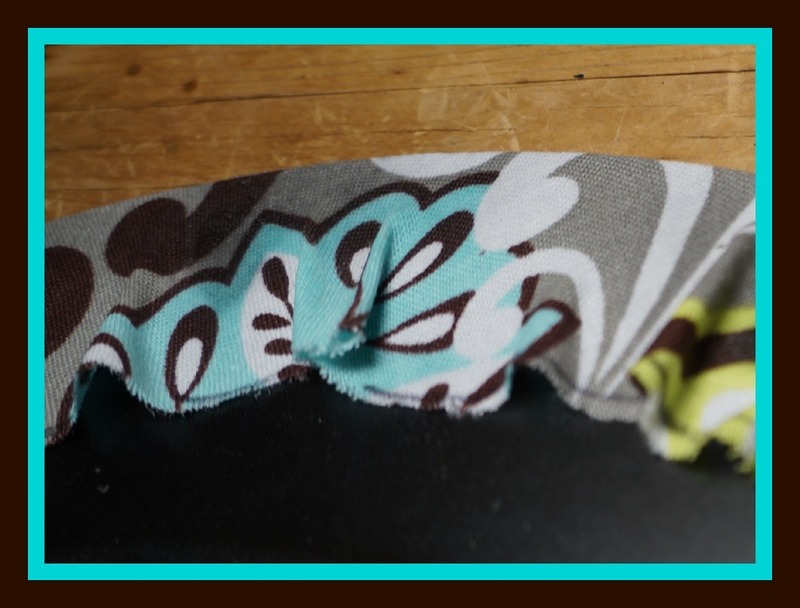 Well, I went back over to Ruth’s picks and realized the main one is the exact same pattern as my now favorite ribbon! I jumped in all the way! 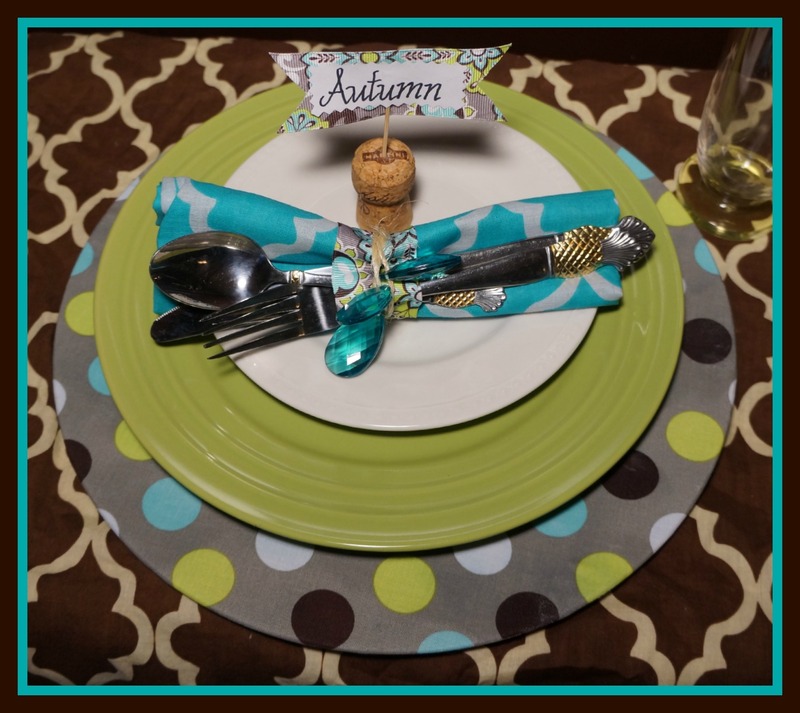 I became bold about designing my dining room table settings, and I’m going to enjoy the jump! I’ll bring my camera and keyboard along for the ride so that all of you can share in the joy that IS color in our home! Here’s what you’ll need for this project…. 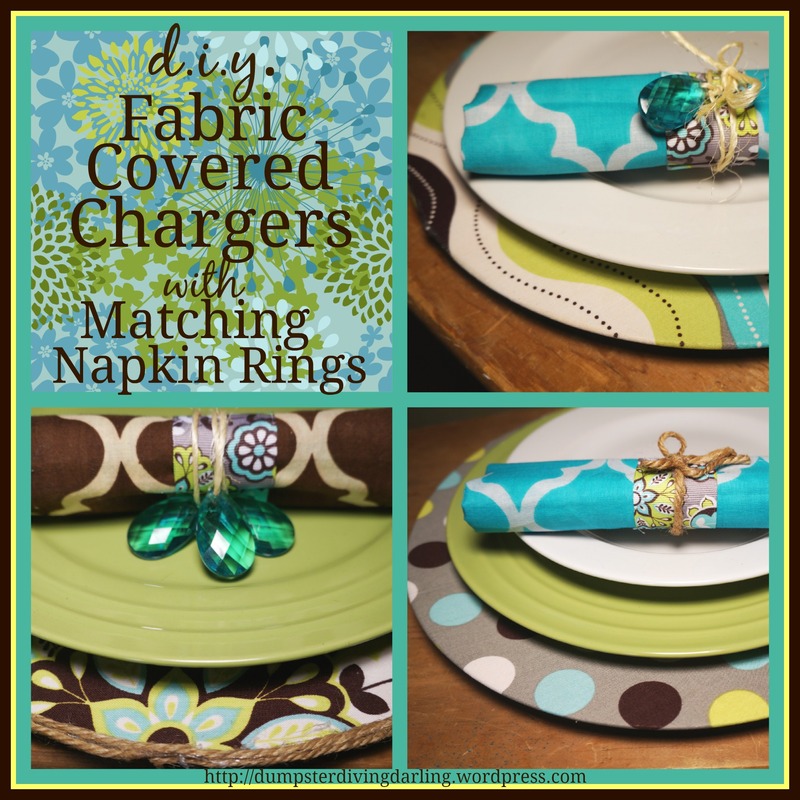 First, place your charger upside-down on your fabric, like this…. Make a circle around your charger about one inch away from the outer edge, like this…. Following the directions of your spray adhesive, coat the charger. The brand I used said to use a medium coat. Further, the directions said to adhere items together permanently, put them together quickly, after spraying. I sprayed a medium-heavy amount on my chargers and the fabric until I could kinda see the glue on it everywhere. 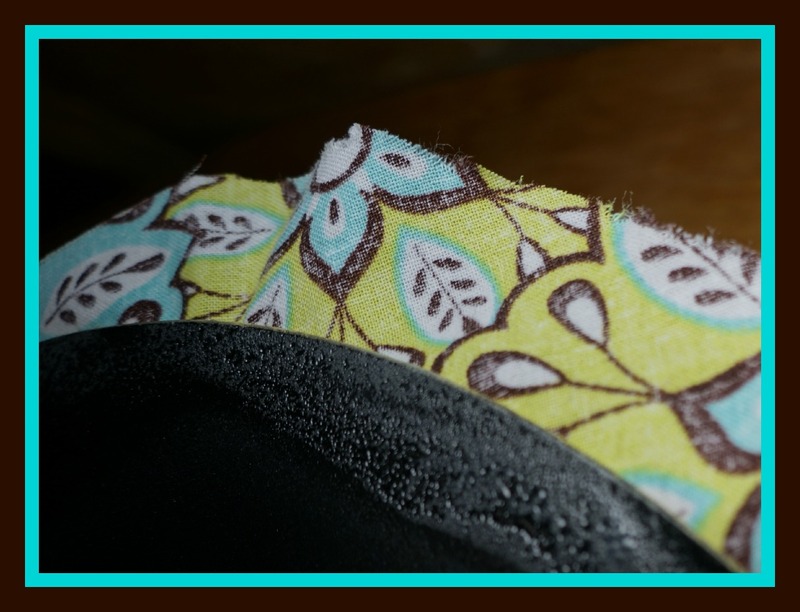 To place the fabric on the chargers, I started in the middle by folding the fabric in half, glue side out. 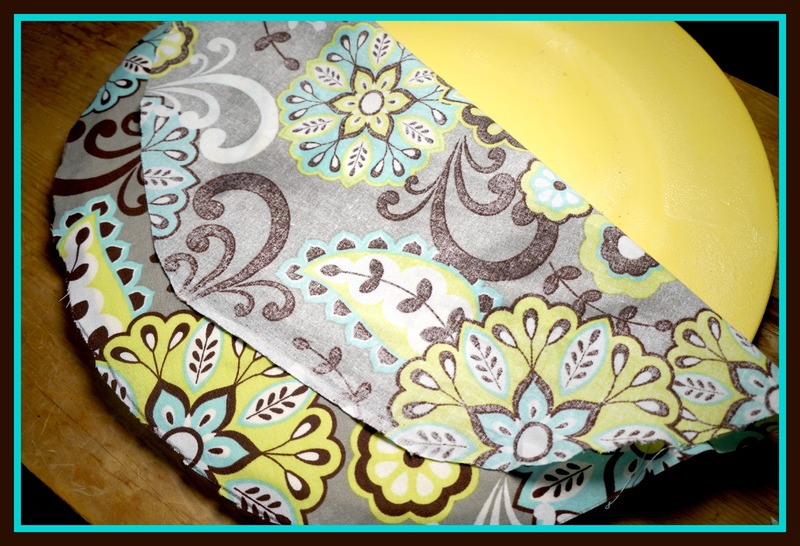 Here’s what it looked like when I first put the fabric on the charger…. Note: This could probably be Mod Podged. I’ll probably try it another day. If/when I do, I’ll let you know how it turned out. If you get to it first, you can let me know! When you get to the edge, you have options. I did the first one so that it was finished like this…. 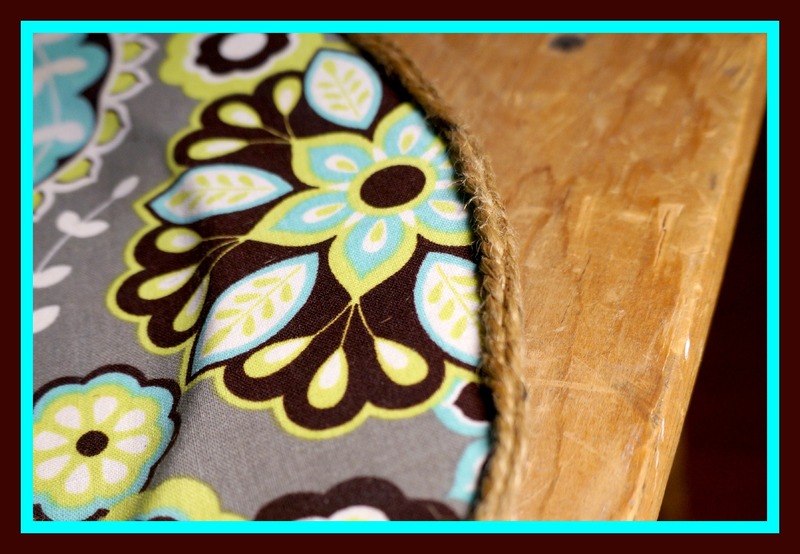 I cut the fabric right up to the outside edge of the charger. 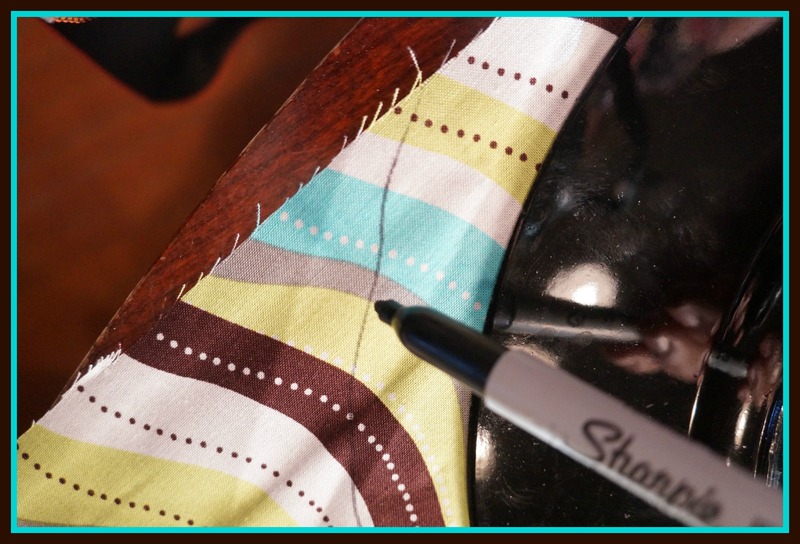 To hide the raw edge of the fabric, I covered it up with two strips of twine I glued (with a glue gun) right over it. This is my favorite look. On the rest of the chargers, I simply sprayed around the edge of the under side of the fabric and outer edge of the chargers. Then I pressed the fabric to the bottom, like this…. I finished the rest of my chargers with this method. It was late, and I needed to get to bed. Now, I wish I would have taken the extra effort and done them with the twine. It really did not take much longer and the finished look on the underside of the chargers is so much better. Not that my guests will be lifting up the chargers and looking at my finished edges (although, if they are readers of my blog, they may!). I just know the little bit messier crumpled edge is there. Live and learn, right? Here’s so more pictures of my finished chargers. They are super super SUPER cute! I can’t wait to have company to show them off to. Until then, I added to my china cabinet vignettes. Now it has even more color and I can’t stop looking at it! You can see how I added color to my china cabinet without spending a fortune by checking out this link…. 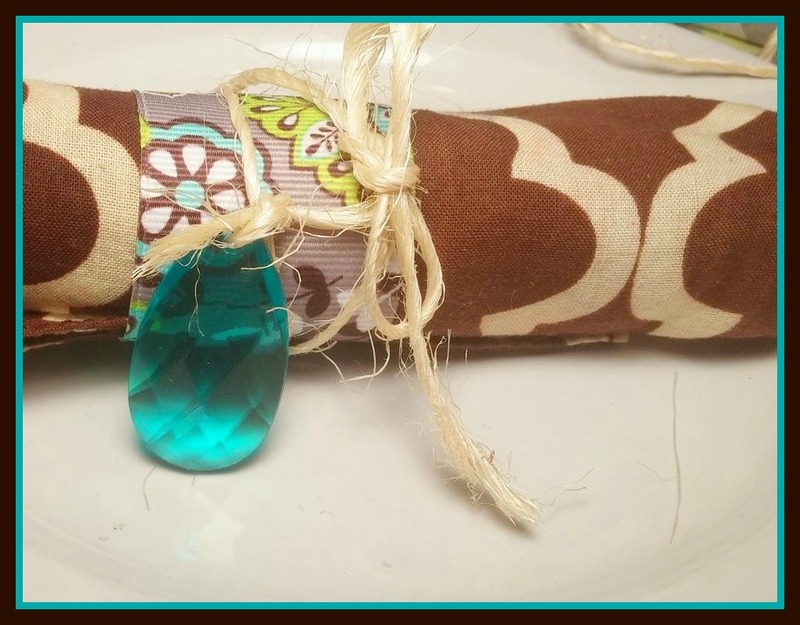 Look for part two of this series to find out how I made the napkin rings! This entry was posted in Crafty, Organization, Spring Cleaning and tagged arts and crafts, artsy fartsy, closet, craft, crafts, crafty, d.i.y., decor, dish, diy, diy craft, food, glitter nail polish, home organization, jewelry storage, organization, organize, organized, organizing, paint, recycle, repurpose, reuse, spring cleaning, storage, storing, upcycle, vase. I decided to build it. Actually, it was okay becauseI really was joking. The only place we’d have room is the bathroom. Then we’d need to rent a port-potty, permanently (would that be a perma-potty? ), and we would have to shower in the rain. Ya know, it may be a hassle after all. Truly though, when a person is trying to save money on groceries (even if they do not use coupons), they must have a pantry. A “storehouse” is integral to being able to purchase discount, sale, and bulk groceries. Our 100+ year-old house did not have a pantry. Not a big cabinet in the kitchen, not a closet in the hall, nothing. I needed something that would do until I become a famous blogger known for not spending money. Then I will make some money and can have a pantry. Until that day arrives, we did this…. I have seen many posts that show beautiful pantries, with matchy-match colors, perfectly poised boxes (whose colors miraculously match as well), and a lot of leftover space! That just isn’t realistic to me. Those of us who buy in bulk, don’t color match our macaroni and cheese with our jars of jelly, and who generally… have a life are not going to achieve such pantry beautification. 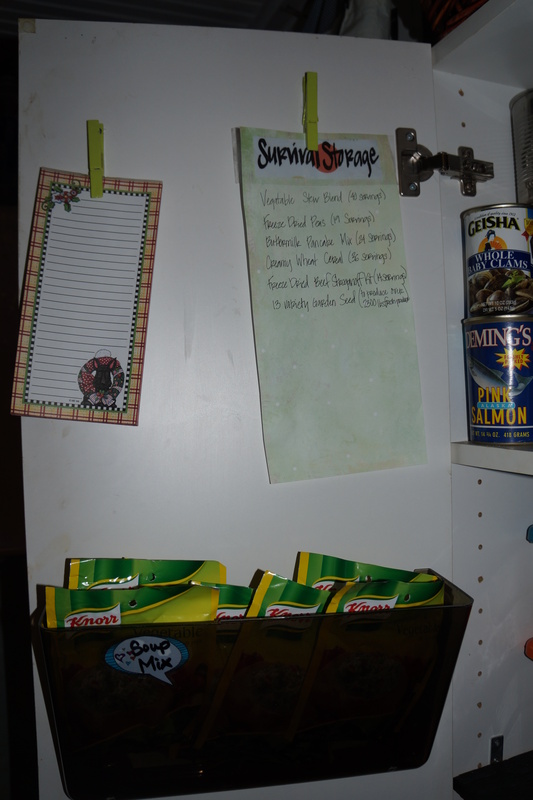 In fact, before this blog, my pantry had become a piled-in-as-soon-as-we-got-the-groceries-home mess. It was clean about 2 or so months ago. There’s just been a lot going on. Like sales. On Rice-A-Roni. 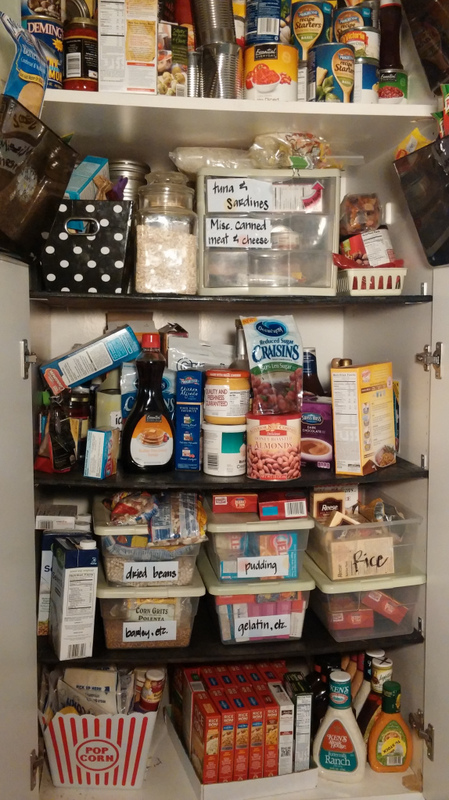 Here’s the “before” of our pantry…. Now that I take a closer look, it isn’t really that bad. I mean, the doors closed all the way. It just needed a little bit more attention…. and color. 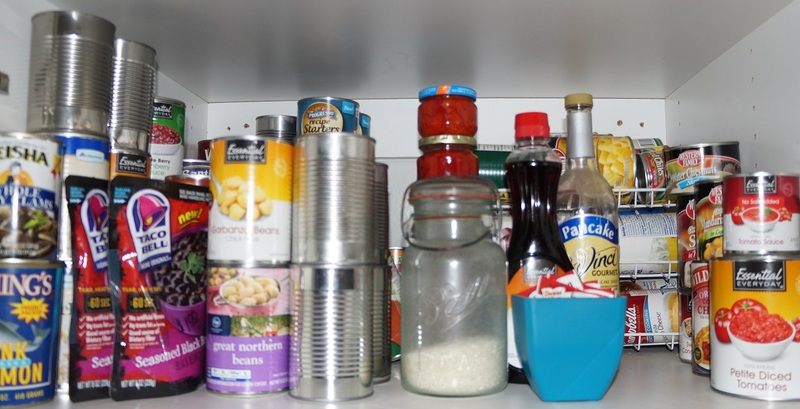 So here is my take on how to realistically organize a pantry…. Containers… I use everything from plastic drawers to old milk jugs, mason jars to plastic shoe boxes. 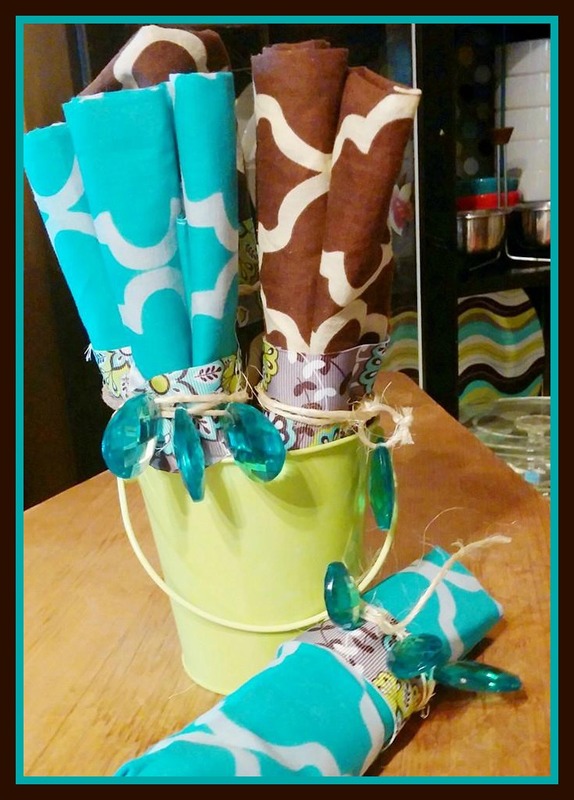 You can use flower pots, decoupaged cereal boxes, dollar store baskets, or vintage refrigerator bins. I even used a cardboard flat that was with a case of beans we bought! Be creative. Make this fun! Spray paint. Those matchy-match people actually have a great idea in adding color to their pantries. I love color. 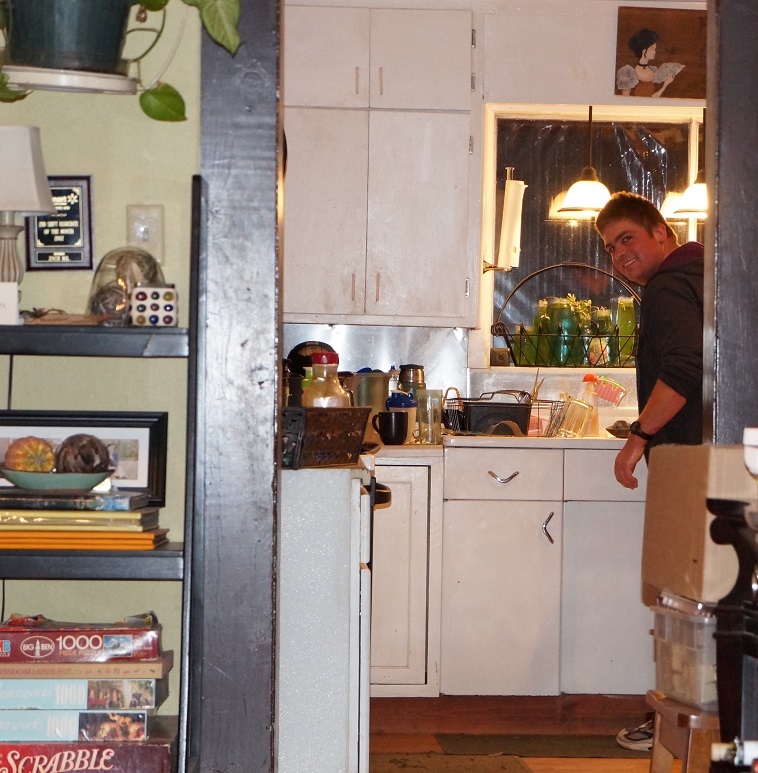 Seriously… when I open my pantry doors, I feel kinda happy! Is that weird? I dunno. The bright orange and blues just feel good. Ideas. Surf the web, google pantry ideas, and gather up your Pins. If you like an organizational idea, use it! 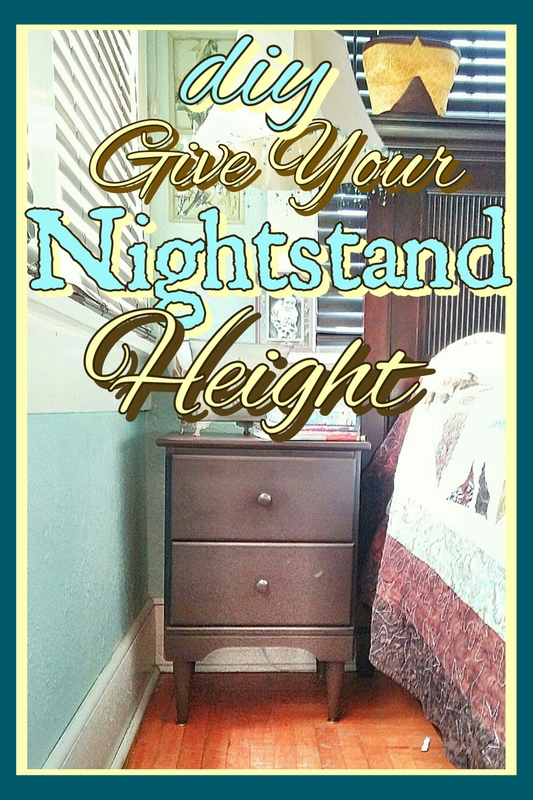 Even if it’s a huge idea and you have a tiny pantry. Find a way to incorporate ideas you are attracted to. 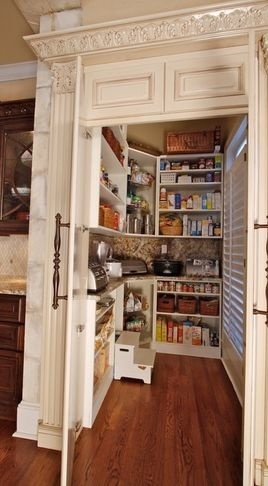 There’s no reason you shouldn’t actually enjoy looking inside your pantry! A Plan. Make a plan. Are your canned goods all going together, or will you separate fruit from meat and veggies from sauces? 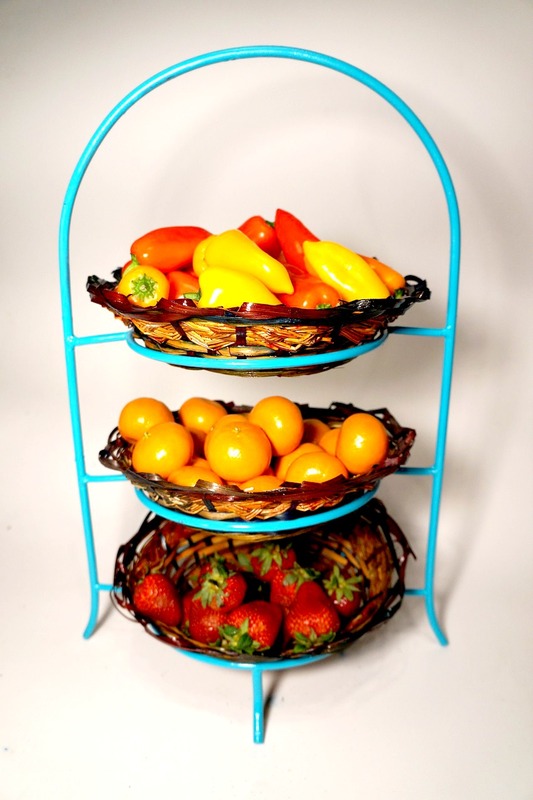 Will all of your boxed items go together, or will some of them go in a big basket? Decide what you want together, and which shelf it will go on. 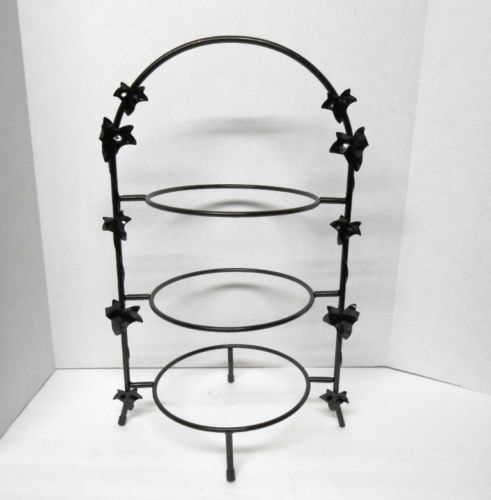 DISCLAIMER~ We have another, industrial style shelving unit, in the dungeon basement. On it, we keep our survival storage (I used to feel kinda weird saying that, but now it seems, everyone has one. Thank you everyone. ), our bulk overflow, and our case lots. I also keep things down there that I have no business partaking of on a regular basis (ie: soda… What can I say, it keeps me accountable.) I just thought I should make it clear that I have other space, but still I think “realistic” fits within this post. Interior Top Shelf ~ Most of the canned goods. Now for some pictures and explanations…. These baskets are quite large. 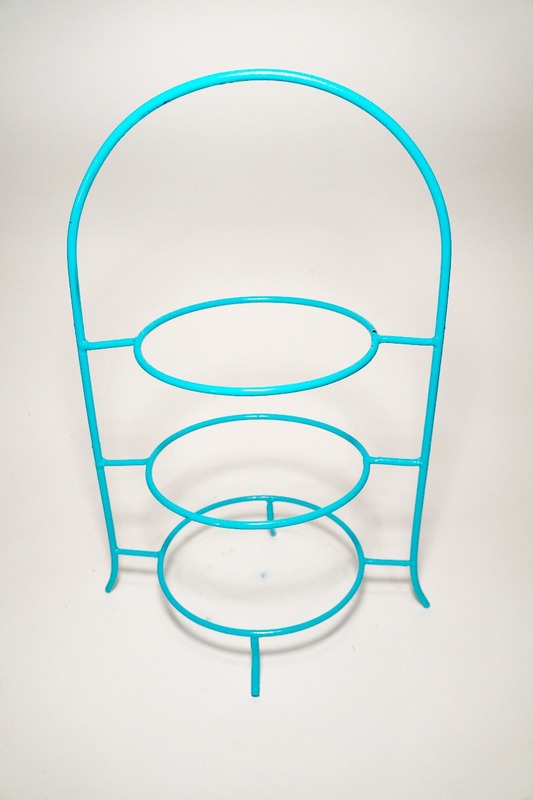 One is a locker basket I got for free before anyone realized they would be vintage someday! For the baskets (there is one for snacks in the back, out of view) you can’t see through, I used tags I had in my scrapbooking stuff. I mix (almost) all of our canned goods together. I have a rack that can’s roll into. I like it very much. Honestly though, if space is an issue, and you need every little last miniscule bit of it, you may not want something like this. The cans are organized in type. The ones without labels were in a canning plant sample sale. Things I have on hand at all times (like Mr. Awesome’s favorite spaghetti sauce) are in the back. I know automatically what is back there, so no need to search. Things that are a little more rare, I keep in front. This way, I remember to use them up. I spray painted the lids of the plastic shoe boxes some fun happy colors. The black with whit polka-dots bin is from the dollar store. There are bags of soup mix in that. I lay my boxed foods down, and stack them. 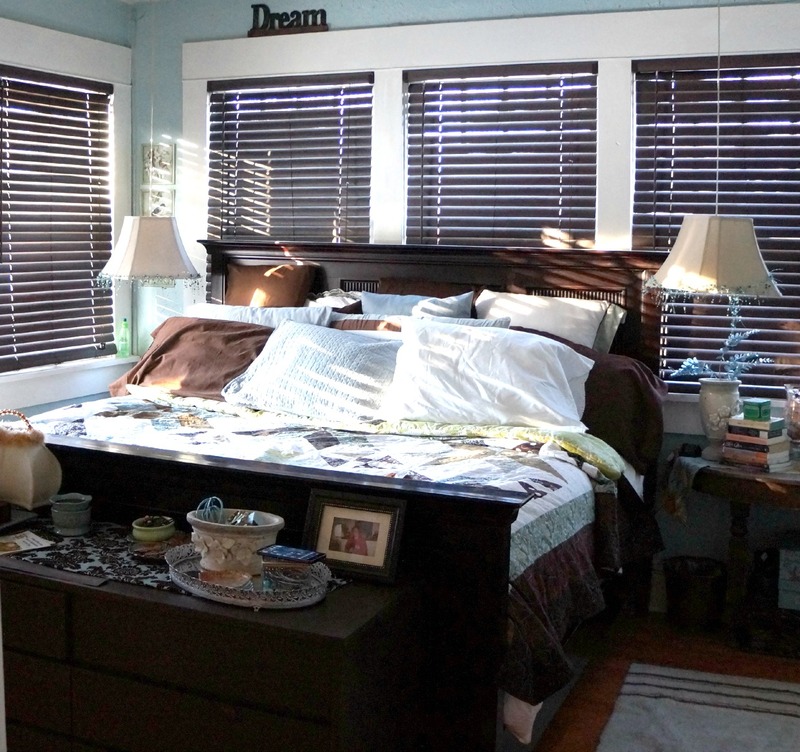 They are easier to see and you can fill every inch of space this way. By putting the bins in front, I can easily remove them to reach the items in the back. That Prego was like .50 cents. I never ever buy stuff like that. That’s why it’s in the front. That’s the same reason I have these items so close to the top. We just don’t “normally” have cake mix, Hamburger Helper, etc. on hand. I don’t want to forget about them! That does happen. Nothing worse, pantry-wise, than throwing away .25 cent boxes of quick fixes. These are also things I’ll forget about if they aren’t easily seen. Things like béarnaise sauce and almond paste. They aren’t normally on hand, but I pick them up when they are on clearance. Again, in the front, are items I use on a regular basis that are easily removed. Isn’t it surprising how okay looking a painted milk jug tote can be? This is really my regular items overflow shelf. Multiples of dressings, sauces we regularly use, and Rice-A-Roni I bought for a quarter each. That Coca-Cola container was in the .08 cents pile I’ve told you about before. That Orange tray is a simple cardboard shipping flat we bought canned goods in. I spray painted it bright orange and it’s one of my happy things! 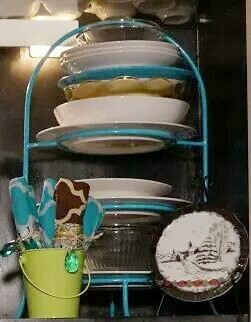 I think the idea for the magazine racks in my pantry came from http://athriftymom.com/. She has sooooooo many wonderful ideas! I discovered her when I started couponing. 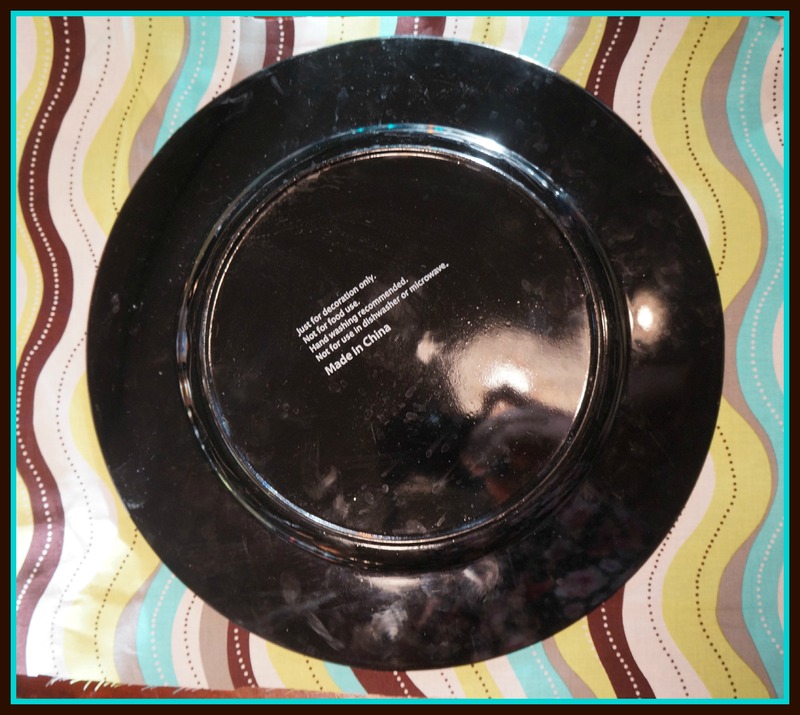 She has a lot of great thoughts on storing things, crafts, menus, ideas for kids… a great conglomeration of inspirational ideas. 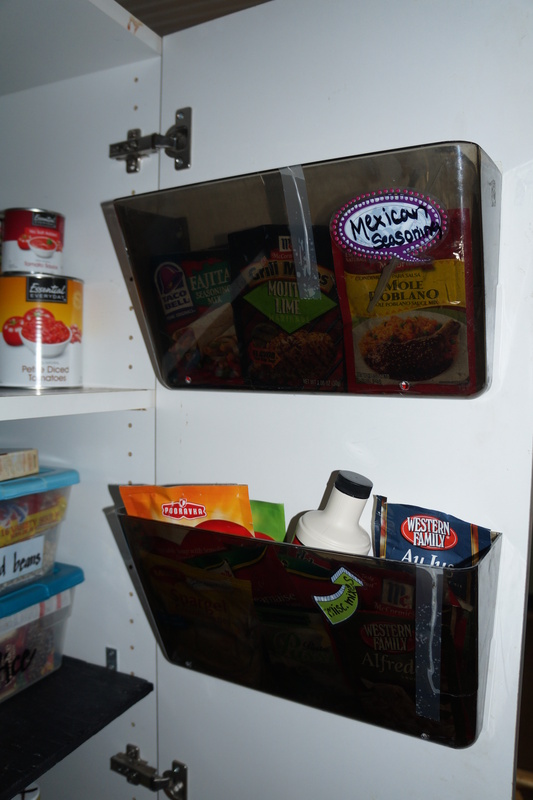 Anyways, I use the magazine racks (which were free, I don’t remember from where) on the doors for storing seasoning packages, spice mixes, and other mixes. We also have an inventory list of large items from downstairs in the pantry and a pad of paper to use for menu ideas and grocery lists. 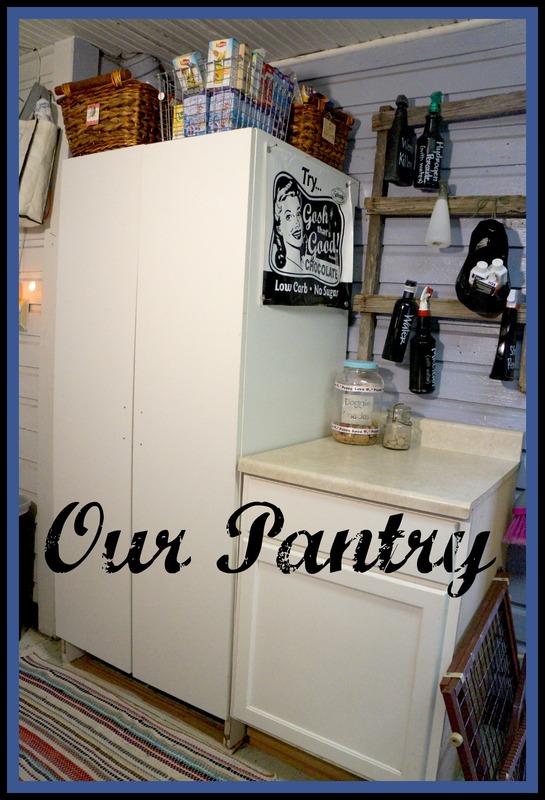 Whether you have a pantry or not, I hope you will be able to incorporate some of my ideas. As always, please feel free to share what you come up with! 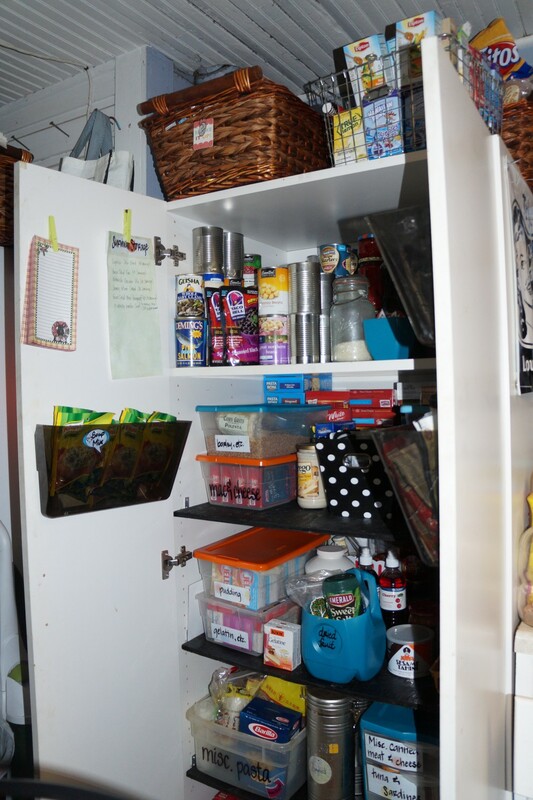 This entry was posted in Crafty, Organization, Saving Money on Groceries and tagged clean freak, everything in its place, food, food organization, food storage, groceries, home organization, neat and tidy, organization, organized, pantries, pantry, staples, storage, storing food.